On Tuesday 10th of October it was with great excitement that we arrived at the Ivy House Hotel. 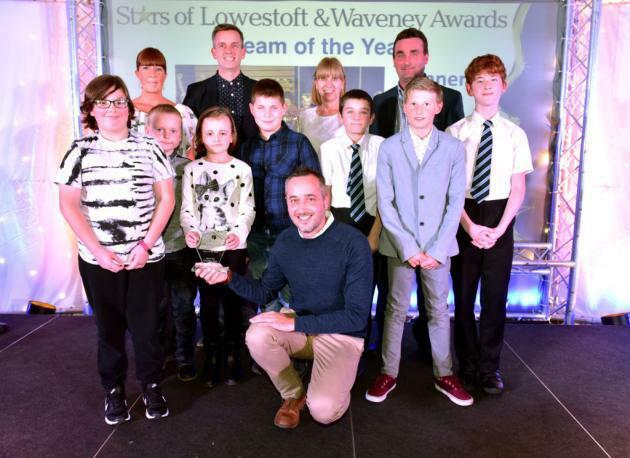 We took seven of the children from our Copper Box winning panathlon team to the Stars of Lowestoft and Waveney Awards 2017 ceremony. We were shown to our table where we helped ourselves to a delicious buffet meal. The room was filled with excitement, smiles and anticipation. There were many awards and gifts handed out during the evening. Next it was our category. The nominations were read out and the children sat with great pride listening to their great winning achievement this year at the Copper Box. The golden envelope was in hand and the children waited with baited breath…..The Winners of Team of the Year goes to Albert Pye Panathlon Team!!! The children were amazed and beamed from ear to ear. They eagerly led the way to the front of the room to take centre stage. We were joined by Woody Bear and given our fabulous crystal trophy and bottle of champagne. Woody Bear gave the children a Halloween bag with two tickets each to Pleasurewood Hills. We did lots of posing for the cameras and then returned to our table still beaming with excitement. Mrs Mills, Mr Adcock , Mr McKenzie and Mrs Chambers could not have been prouder of team, their regional achievements had been recognised and they all truly deserved this title too. It was great to have the Y7 students return to join Albert Pye for the evening as they were a big part in our win at Copper Box. It was a truly wonderful evening to be part of and the children’s behaviour was impeccable throughout. Well done panathlon team, keep up the fabulous work and keep being yourselves, we are very proud to have you as part of our school.